As I have said before, Sunday lunches can become rather predictable, but this is one of those accompaniments that adds some new flavours, giving a new twist to the familiar. Other ways of bringing a fresh approach to a roast joint are pre-marinading the meat, as in Australian Spiced Roast Pork or by adding an unusual sauce, such as Roasted Balsamic Onion & Thyme Sauce. The moment I watched Nigel Slater make this ragoût recipe on television just after Christmas I knew I had to try it. All the ingredients were handy, including some juniper berries which I had bought in France (they were a bit old, but never mind – I just added a few extra!). I was also already planning to serve roast beef the following Sunday. In place of the fillet beef used by Nigel Slater in the original recipe I slow roasted a topside beef joint using my usual Sunday lunch method. 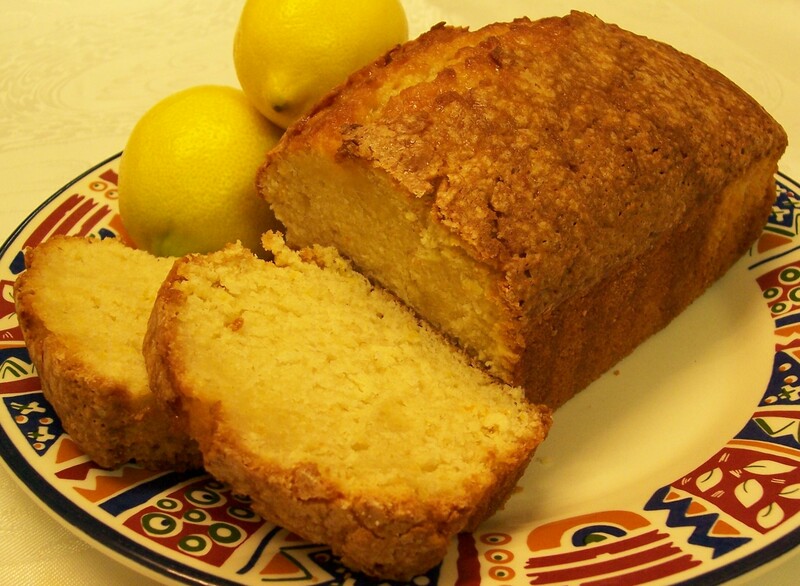 It was a definite hit with the family and I will certainly be making it again. In fact it is an unusual dish to serve when entertaining and especially useful as it can be made in advance and reheated – always a plus on a busy Sunday! The original recipe was part of the programme Nigel Slater’s Christmas Suppers and was called New Year Roast Filet of Beef with Pumpkin Ragoût. In place of pumpkin I substituted a butternut squash, which is readily available through the Autumn and Winter and useful for so many recipes. I would be interested in trying this without using white wine as this is not always available, but the juniper berries gave a delicate flavour and the buttery sweetness of the Butternut Squash complemented the beef really well. 1. Peel and finely slice the onions. Gently heat the oil in a large frying pan and cook the onions slowly. Strip the rosemary leaves from the stems, chop them finely and crush the juniper berries. Add both to the onions. Continue to cook gently for about 15-20 minutes until the onions are softened. 2. Remove the peel from the squash or pumpkin, take out the seeds and thinly slice into small 1cm/½in thick pieces (or larger if you wish.) Add the pieces of squash or pumpkin to the onion mixture and fry for 4-5 minutes. 3. Sprinkle over the flour, stir well and carry on cooking for about five more minutes. 4. Add the stock and wine, bring to the boil, season and then lower the heat. 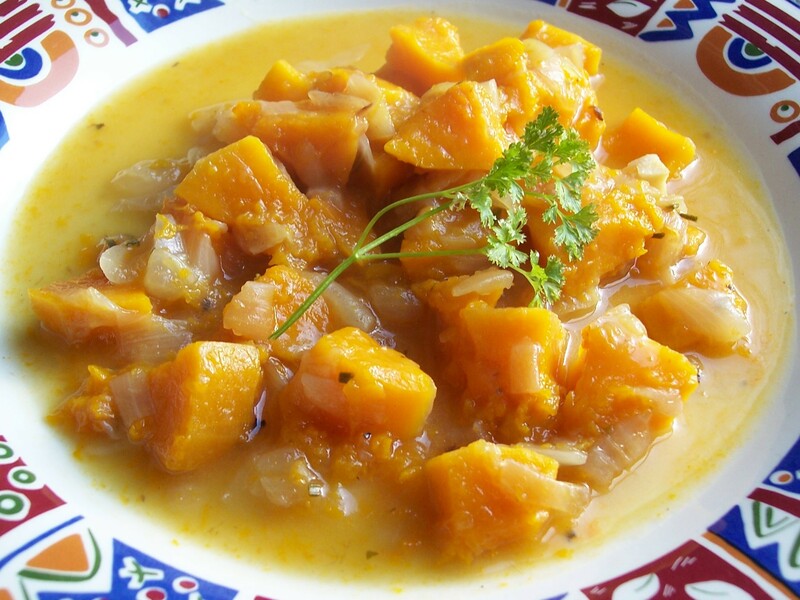 Simmer, stirring occasionally, for about 20 minutes, or until the pieces of squash or pumpkin are tender. 5. Stir in the chopped parsley just before serving. 6. To serve, spoon the ragoût onto plates and place slices of the hot cooked beef on top. 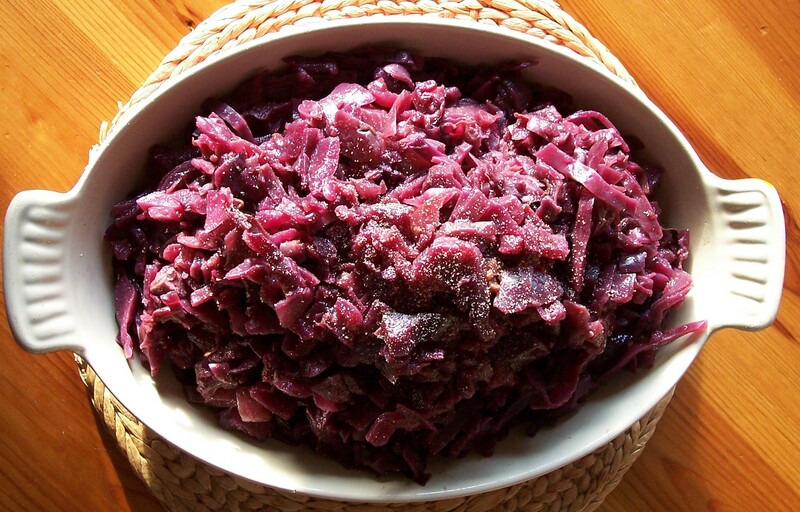 A number of versions of Spiced Braised Red Cabbage are available. I usually use Delia Smith’s recipe, either from her original version of the book Christmas (Traditional Braised Red Cabbage with Apples), recommended with venison, goose, pork or sausages and mash, or from her Complete Cookery Course (Braised Red Cabbage with Apples), suggested to accompany sausages or cassoulet. (I ought perhaps to try it with my own Cassoulet ‘Franglais’!) It seems to be a good accompaniment for most meats. 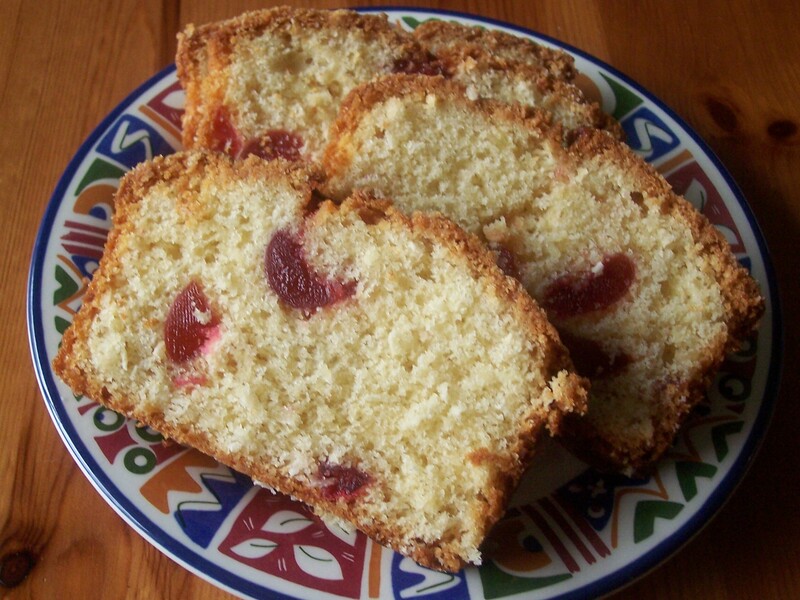 Sometimes Cranberries are included, which make a particularly Christmassy addition. I have made this recipe in a saucepan on the hob, giving it a long cooking time over a very low heat, but it is far better made in the oven. I follow the recipe almost exactly as it doesn’t really need any improvement, apart from the addition of the optional cranberries and the crushed juniper berries, a flavour which I love. Some recipes add ginger, apple juice, orange juice or stir in ready made cranberry sauce: all these would add their own twist to the basic recipe and the challenge is to get the flavour mixture that you like the best. Although I like the original flavours well enough, I may well experiment with alternative flavours so this recipe could well change as I find something which I consider an improvement. If you make this recipe and add an ingredient or flavour not listed here please do leave a message in the comments. 1. Pre-heat the oven to 150oC/300oF/Gas 2. 2. Remove and throw away the tough outer cabbage leaves. Quarter it and making a ‘v’ shape remove and discard the tough stalk in each piece. Shred the rest of the cabbage finely, using a sharp knife. 3. Peel, core and chop the cooking apples in small pieces. Skin the onions and chop them small. 4. Layer the ingredients in a large ovenproof pot or casserole, alternating layers of shredded cabbage seasoned with salt and pepper with layers of chopped onions and apples with a little garlic, spices and sugar. Continue with the layers until all the ingredients are used up, apart from the vinegar and butter. 5. Pour over the wine vinegar and dot pieces of butter on top. 6. Cover with a tight fitting lid and place in the oven to cook slowy for 2 – 2½ hours. Stir the ingredients well twice during the cooking time. 7. Grate a little extra nutmeg over the top as it is served, if you wish. I wonder what you consider to be storecupboard essentials? Which items do you always have available and make sure you re-stock almost before you run out? Although my storecupboard is stuffed full of interesting ingredients there are those I make sure I never run out of and several of the ingredients below, including tins of tomatoes and beans which are a wonderful standby, appear in my Top Ten ‘must haves’! I try never, ever to be without coriander leaves: fresh if possible, but when I have a part bunch left I transfer it to a box and store it in the freezer so I never run out. It is better this way than not at all: the taste is the same it’s just no good to use as a garnish! This recipe is my own and uses some of our favourite flavours. It, or its variations, make regular appearances as a quick and versatile vegetable recipe and can easily be made in one pot to serve as a single side dish with a main course. We enjoyed it served with Roast Lamb with Chilli Sauce and North African dishes such as spicy Moroccan Style Fried Fish (a variation of a Nigel Slater recipe). Alternatively, for an ‘all in one pot’ meal, stir in some more vegetables, topped if you want, with grated or crumbled cheese instead add or add chunks of meat (ham or bacon are delicious). We love coriander leaves and it is particularly good if you have added some spices to the mixture, but it could be omitted or another herb substituted. 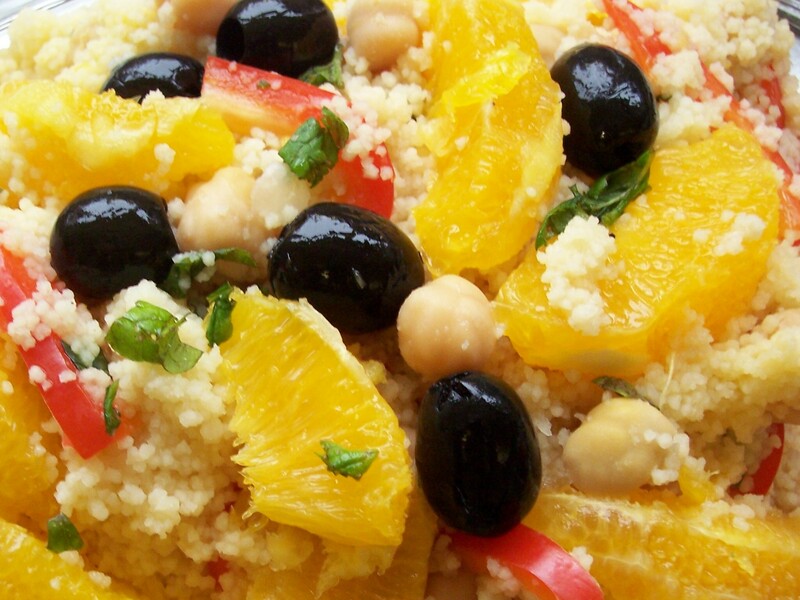 That’s the beauty of versatile recipes: they can evolve into something completely different! It can be transformed into a soup too by adding some more liquid (you may have drained juices from the tin of tomatoes): for a chunky version liquidise about a third and return the mixture to the pan and liquidise more, say two thirds, for a less chunky version. See also Spiced Chick Pea & Tomato Soup. 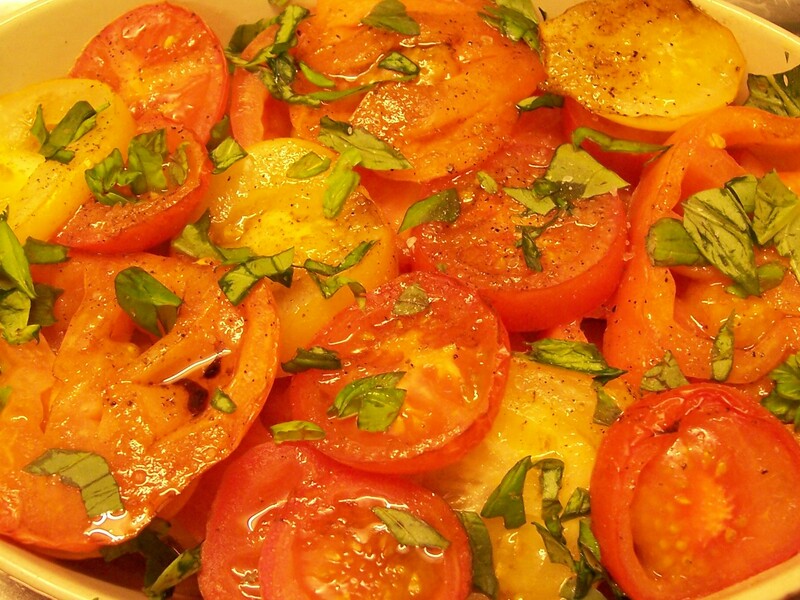 This dish is delicious served hot or cold: filling and warming in the winter, but lovely as a chilled dish with a salad or on a buffet, in fact the flavours seem to develop in the fridge overnight. Remember to save some coriander back as a garnish if using fresh. 1. Heat the oil in a pan and add the onion and garlic along with the ground spices. If using ginger put this in as well. Cover and cook gently over a low heat until the onion is transparent but not browned. 2. If using fresh tomatoes peel them if you wish beforehand by making a cross shape and plunging into boiling water for about 30 seconds, which makes the skins easier to remove. Chop them well before adding to the onion mixture and if the mixture is a little dry add some of the reserved tomato juice or a little water. Add the courgette pieces (or substitute a similar amount of an alternative vegetable: pumpkin, squash or sweet potato are good, though you may like to reconsider your choice of spices) Cook for about 5 minutes. 3. Add the drained chick peas and a generous handful of chopped fresh or frozen coriander (if you only have frozen then add a little more if you wish as you cannot use it as a garnish). Sseason with salt and pepper and continue to cook. For crisp vegetables do not need very long but this can take a longer cooking time as well so the texture is similar to Ratatouille. 4. Serve sprinkled with more freshly chopped coriander if available. If serving is delayed, it will be served cold, or turning it into soup, then reserve the coriander to add just before serving so it does not wilt. 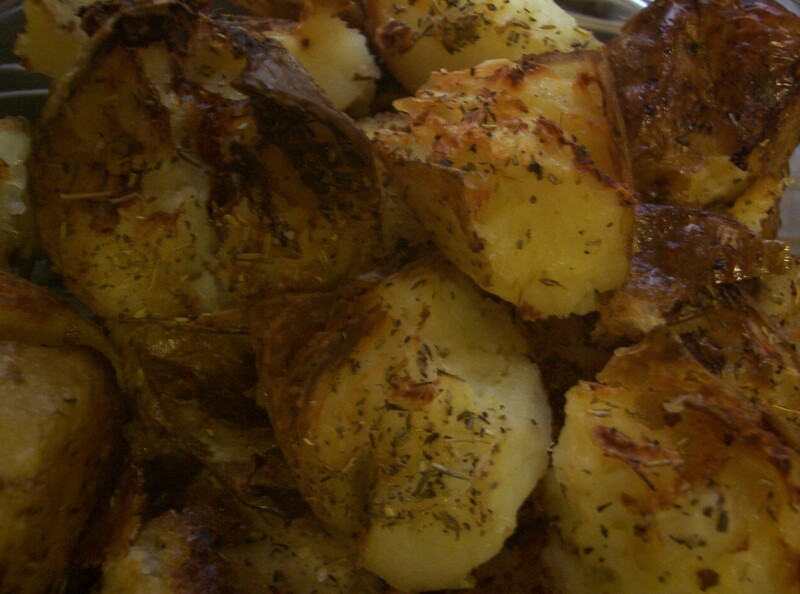 I have had this simple but tasty potato recipe in mind for a church lunch we are having in a few weeks time. However, I felt I needed to try them out in advance so I included them at Sunday lunch this week when they were much appreciated by my visiting parents – a bit of a change from the usual roast potatoes, though equally lovely and crispy. (I usually sprinkle my peeled par-boiled, potatoes with olive oil and sea salt anyway.) This would certainly an easy solution for mass catering as there is no peeling involved, in fact I found that the potatoes can can be boiled in advance and kept in cold water. They are finished off by adding the herbs and oil just before putting them in the oven to roast. I attacked my partly cooked potatoes with the potato masher to (not too violently) crush or ‘smash’ them, thus gaining our name for them: Smashed Potatoes. 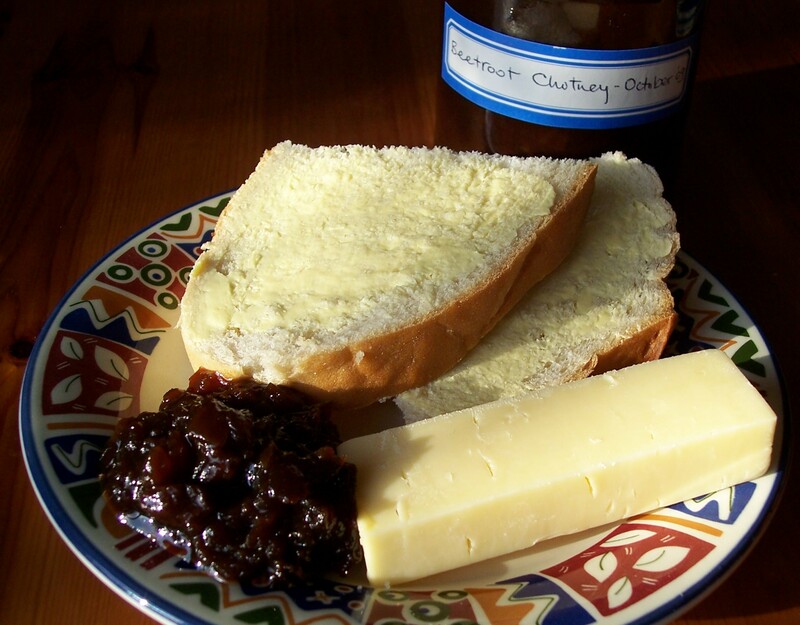 The recipe comes from Celia who writes at one of my favourite sites: Fig Jam & Lime Cordial, where the potatoes were named ‘Splats’ by one of her friends. She credits the recipe to Jill Dupleix who calls them Crash-Hot Potatoes. (Jill, like Celia, comes from Australia and not unsurprisingly I have not heard of her before. I took a look at her site and found a whole list of other good recipes: all of the ones I saw having weights, very usefully, in metric.) They have been much written about by other food bloggers too, so I now add myself to the list of ‘converts’ and this site, ‘Meanderings through my Cookbook’, to the list of sites that sings their praises! This time I added mixed dried Herbes de Provence with the freshly ground salt and black pepper as I wanted to keep the flavours simple to complement the marinade flavouring our Roast Pork. Jill suggests adding either fennel or caraway seeds plus sprigs of thyme or rosemary: a great idea idea which would vary the flavour from meal to meal. I expect there could be some other variations too, matching flavours of added herbs and spices to the meat or main course eaten: if you have tried these another way I would love to hear from you. 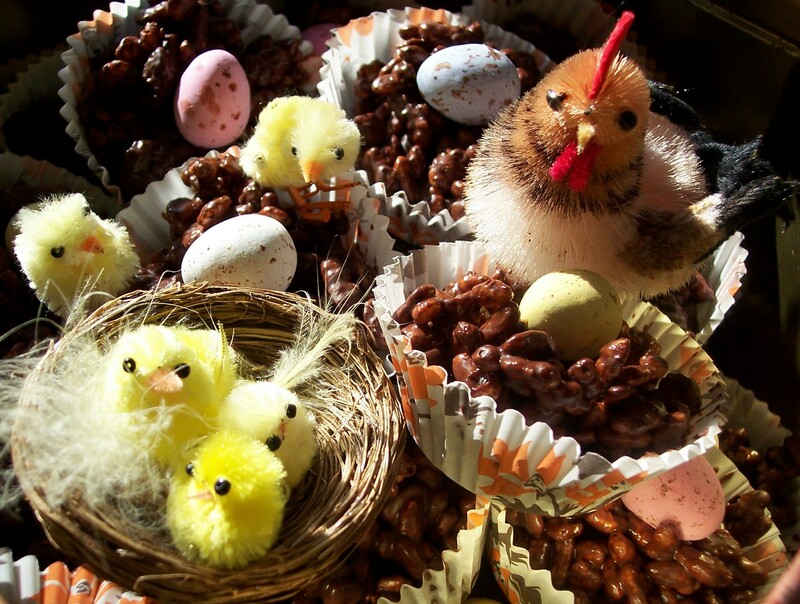 Just one comment: I had made these just once before and although we enjoyed them I did not leave enough time for them to fully crisp so we felt they could have been better – a mistake I made sure I did not make on this second occasion! I had to use halves and quarters of larger potatoes but I intend to make these again using smaller evenly sized potatoes and will post another (better) picture in due course. 1. If planning to cook these potatoes straight away, heat oven to 220oC/425oF/Gas 7 or even (and preferably) 230oC/450oF/Gas 8. 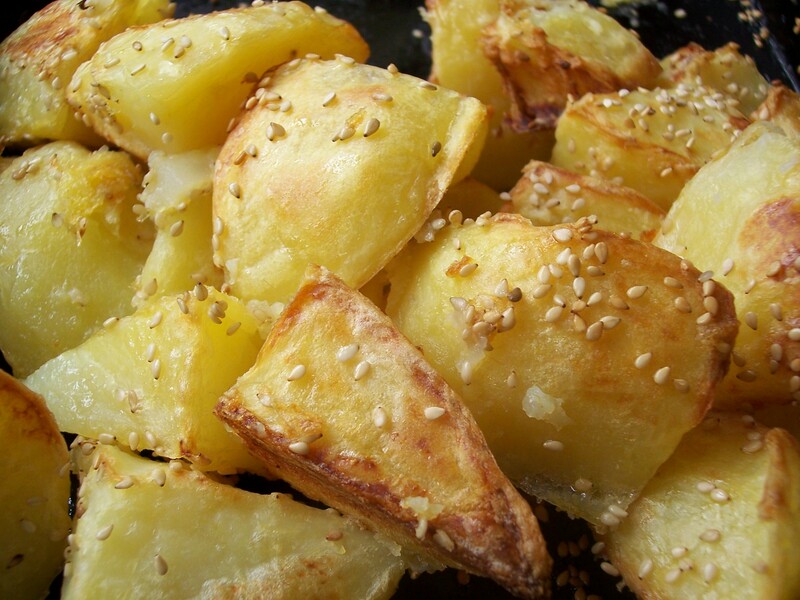 A good hot temperature will crisp and cook the potatoes quickly. 2. Scrub the potatoes and remove any blemishes but do not peel them. Ideally choose evenly sized smallish potatoes you can leave whole, but if absolutely necessary, larger ones can be halved or even quartered. The finished look will, of course be different though. 3. Bring the potatoes to the boil in a panful of salted water, turn down the heat and simmer for about 15 minutes until just about cooked but not too soft. They should be able to be prodded with a skewer or fork without much resistance. 4. Drain the potatoes and if necessary, plunge into cold water to keep for a while until it is time to finish them. 5. Turn on the oven as at No 1, if not already preheating. Arrange the potatoes on a lightly oiled baking tray or sheet, leaving a little room between each one for them to spread. Using a potato masher flatten each potato a little, so it starts to crack open and it is about twice its original diameter. 7. Bake on the top shelf of the oven for 20 to 30 minutes until crispy and golden, gently moving them around half way through the cooking time to stop them from sticking to the baking sheet. Serve hot. If you need to cook these at a lower temperature than indicated above then make sure you allow a longer cooking time. Cabbage, along with Spring Greens and Brussels Sprouts, gets a really bad press. Its not surprising really – I am sure we have all eaten really awfully cooked cabbage, greens or sprouts at one time or another … overcooked, watery, tasteless, colourless… It’s no wonder that generations of children rebel! However, cooked properly, these green vegetables can be really tasty. The secret is a short cooking time to retain crispness and colour: about 7 minutes for sprouts should be ample. 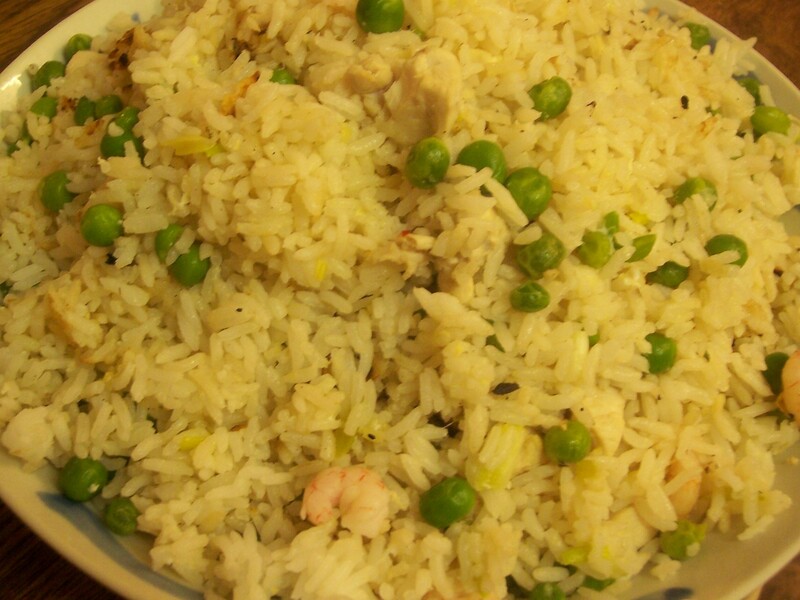 If you wish, extra flavours can be added as in this recipe. I used a round winter Savoy Cabbage, which has a wonderfully ‘ruched’ texture. Substitute a different type of cabbage, shredded or quartered Brussels Sprouts or even Broccoli for variety. 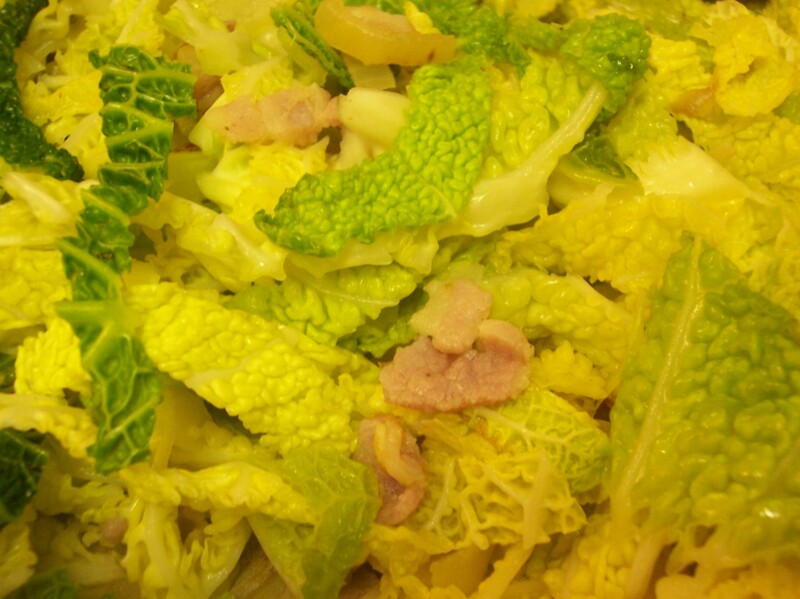 This recipe comes from Delia Smith’s Complete Cookery Course, originally simple called Fried Cabbage with Bacon. It is quick and simple and can be ready in about 20 minutes, an ideal accompaniment for sausages or simply grilled meat. Be careful not to cook the cabbage over too high a heat or it could could burn: add a little water (two or three teaspoons at most) and lower the heat if this does start to happen. 1. Using a large frying pan, gently fry the diced onion and chopped bacon in the olive oil for about 5 minutes until soft. 2. Stir in the crushed garlic. 3. Add the shredded cabbage to the pan. It will seem to be rather a lot, but will cook down. Stir from time to time so it cooks evenly. Season to taste. After 10 minutes the cabbage should be cooked, but will still be crisp. For softer cabbage put a lid on the frying pan so that it will cook in the steam, but beware overcooking. 4. 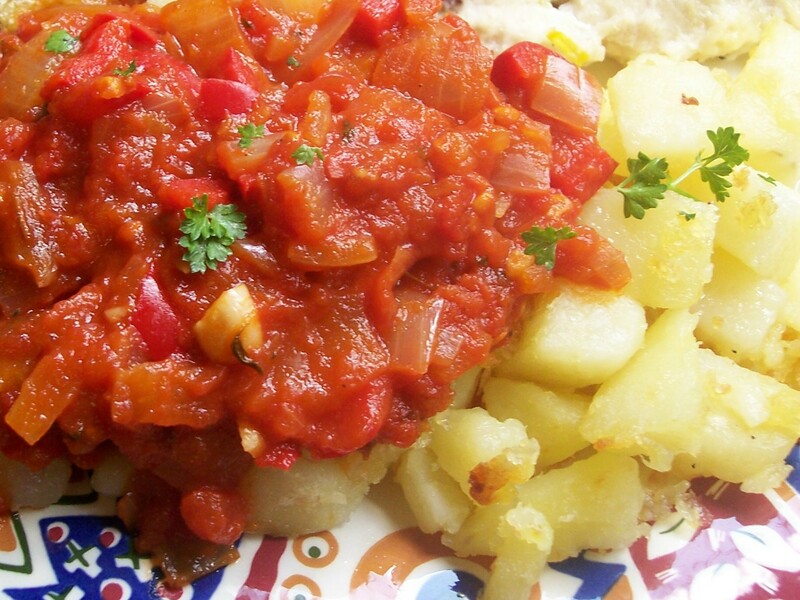 Serve with sausages or grilled meat and a jacket potato.